On the Sunday afternoon of the Worcestershire game at Wantage Road, I found myself sitting in the back row of the Briggs & Forrester Family Stand. If there is any sun, this stand traps it (several tattooed men had stripped to the waist, closed their eyes and were using it as a cheap alternative to a tanning salon) ; there was also a strong south-easterly wind. A few rows in front of me sat a ruddy-faced man from Worcestershire (I like to think he was a retired pear-farmer) wearing a broad-brimmed canvas hat. Perhaps nine times in the hour I sat there the wind blew the hat off his head. Sometimes it lifted it vertically, like a Harrier jump-jet, and flipped it backwards on to the seat behind ; sometimes it spun off horizontally like a Frisbee ; once it cartwheeled away and came to rest four or five rows back. Every time, the man patted his head to confirm his headgear had gone, before, with a look of mild puzzlement, trotting patiently back to retrieve it and replace it on his head. It did not seem to occur to him to take his hat off, or move to a less blowy location. Something about this scene seemed to me to suggest the mentality of the regular watcher of County cricket : the dogged persistence, in the face of considerable experience to the contrary, in believing that, if you turn up day after day after day, you will eventually be rewarded with the discovery of whatever it is you have come there to find. I say “you”, but, of course, what I really mean is “me”. I have often referred to Cardus’s visions of the ideal, Platonic season (In “Prelude” and “the Summer Game” and elsewhere), where “when June arrives, cricket grows to splendour like a rich part of the garden of an English summertime” and “if the sun be ample and you close your eyes for a while you will see a vision of all the cricket fields in England at that very minute” and I would count myself unlucky if I did not, at least once a year, surprise, or be surprised by, some midsummer spirit of cricket (and often in some of the less looked-for places, such as here, or even here). Whether, if ever, the season, like a budding English garden, blooms and “grows to splendour” depends on that elemental, but banal quantity, the English weather. Midsummer should be England’s dreamtime, but this year it has struggled to emerge from a fitful, interrupted sleep. Or, to put it more prosaically, we have had an awful lot of rain and, if not rain, then cloud. On my return from Scarborough, I had been intending to eke out the holiday feeling by pursuing the spirit of cricket to one of its likelier hiding places, the Cricket Festival at Queen’s Park, Chesterfield, which, with its fish and chips and miniature railway, is the nearest the East Midlands has to offer to the seaside. There was little rain during the Festival but, thanks to some heavy rain the week before, there was no cricket either. I do not know whether this was because of exceptionally poor drainage, or over-caution on the part of the Umpires, but I fear I may have to look elsewhere for my Festival spirit and chips in coming seasons. The week before Scarborough I had watched Leicestershire play Gloucestershire. Consulting the photographs I had taken as an aide-memoire, I found several of Chris Dent (the Gloucestershire batsman and occasional wicket-keeper), a few of the patterns of light dancing on the back of the score box, several of the boundary fence and two or three of some copulating ducks, which were pretty much the salient points over the four days. As anyone who had consulted the weather forecast knew (and I believe Leicestershire Captain Cosgrove has now picked up this Pommy habit) there was little chance of a result from the outset. By lunchtime on day 2, Leicestershire had made 334. By the time play resumed at the beginning of the fourth day, the first question was whether both sides would forfeit an innings to set Gloucestershire a target of 335. The ducks had made their appearance late on the first day, making a horrible racket as they frolicked shamelessly in the outfield, to a running commentary from the Leicestershire balcony. Ducks are never a welcome sight on a cricket field, but this was a disgraceful performance. There were no ducks (or low comedy of any kind) at Trent Bridge, where I witnessed another day of “proper cricket”, the fourth day of the game between Nottinghamshire and Lancashire. Nottinghamshire began the day with victory in sight, a vision that slowly faded as Lancashire batted out the day, led by an obdurate, but not inelegant century from nineteen-year-old Boltonian opener Haseeb Hameed (who might, at some point, make a good opening partner for Alex Lees). If the keynotes of the day were Stoical restraint from the batsmen and mounting frustration for the Nottinghamshire crowd, there was also one moment of cathartic relief, as Stuart Broad bowled the best ball I’ve seen this season to send Petersen’s middle stump cartwheeling, like my pear-farmer’s hat. My companion for the day at Grace Road (the Last Gnome) had predicted the likely crowd level as “pauper’s funeral” and, by those standards, there wasn’t a bad turnout. At the start of play there were just the two of us, but, at its height, the crowd had swelled to eleven paying customers (including one professional autograph merchant and two small children), watched over by eight stewards and four St. John Ambulance personnel. In the lunch hour a steward was posted to prevent a pitch invasion ; the Gnome and I thought of running on from different sides of the pitch in a pincer movement, but calculated that, in the five minutes it would take us to reach the square, the steward would have had time to call for reinforcements. At these A games, the hope is always to spot some future great in embryo, some budding Waqar or infant Murali, but, if I did, I had the experience but missed the meaning (as the poet hath it). Pakistan (this was the third day of four) had, as you might expect, four nippy seamers who bowled a little too short, a spinner who might have been very effective against English batsmen, and Sri Lanka two or three top-order batsmen who seemed to be under orders to play sensibly “in English conditions”. The main source of entertainment was to see whether the run-rate on the scoreboard was going to dip below one an over (a thing I’ve only seen once before, at a Women’s Test against India). It came close to it shortly after lunch, but accelerated to just over two slightly after tea, before the innings inexplicably collapsed, like a shanty town in an earthquake. When Adam Rossington and Richard Levi walked out to resume Northamptonshire’s first innings on 60-3 at the beginning of the second day against Worcestershire, they were greeted with a barrage of high-pitched squealing and shrieking of an intensity last heard when the Beatles made their debut at the Shea Stadium. It was Schools Day at Wantage Road. If the intention was to introduce the children to cricket, they must have formed the impression that it is a game that is played in brief bursts of about thirty minutes, before a tall man in a white coat (Alex “the Terminator” Wharf) waves his arms about and they all go back into the pavilion, to re-emerge about ten minutes later. Sometimes the men in green hats seemed reluctant to leave and hung around expectantly on the edge of the pitch, while the men in maroon caps seemed to want to get off the pitch as quickly as they could and seemed very reluctant to come out again. The children left at lunchtime, which was just as well, as there was very little lunch available. The Pic’n’Mix stall was open, as was Gallone’s ice-cream van (incongruously staffed by what appeared to be Anna Sharapova’s more attractive younger sister). For members there was a perfectly palatable chicken supreme available in the pavilion, (though in very small quantities), but, as the announcer put it “the Speckled Hen Lounge does not appear to be serving lunch”. This might not be unconnected to a 2nd XI match against Derbyshire having being abandoned due to nine of the players and an umpire going down with food poisoning, but a ground that cannot rustle up a plate of chips or a cheese roll for its patrons does not convey the impression that it is prioritising its traditional clientele. It is a cliché that games are won by the side “that wants it more”. If “it” is promotion, then Worcestershire do want it (and seem well-equipped to attain it), Northamptonshire do not and don’t really need this competition at all, while they are (very successfully)putting all their very limited resources into “white ball cricket”. The incessant delays for rain only delayed the inevitable trouncing, which arrived late on the third day, with Northamptonshire bowled out by Mighty Joe Leach and Matt Henry for 148 and 142. Ben Duckett had been made Captain for this game. If this was in an effort to encourage him to stay with Northamptonshire, it may have been counter-productive. As a 21-year-old with a background in dressing room pranking, he seemed to be struggling to impose his authority on some of the more experienced members of his side. In Worcestershire’s first innings, he explained, with hand-signals, some cunning stratagem he had devised to bowler Panesar, who listened as patiently as a cat. He then positioned himself at short mid-on. The next ball was driven hard and straight into his gut, and then straight out again. In the second, the Sri Lankan Prasanna, in particular, took as much notice of his semaphored field directions as a seagull. In his first innings he had failed (trapped LBW by Leach for 4) but, when he opened Northants’ second innings shortly before lunch on the third day, the romantic optimists in the crowd (less common at Wantage Road than Ukrainian beauty queens though we are) might have been anticipating an epic, match-saving Captain’s innings. Duckett comfortably rode out the opening blast from Henry and Leach. Then, predictably, Worcestershire brought on D’Oliveira Minimus (who has added about three inches to his height with a Little Richard style pompadour) to bowl his heritage leg-breaks for an over before lunch. The first two balls were full-tosses, which he slop-swept imperiously for four, the third a better-pitched ball, which he blocked. The fourth he tried to sweep again, but scuffed it up just short of one of the two deeply silly short legs he had been engaging in conversation. The fifth an exact repeat of the fourth, except that he was caught. Very late on an elderly man returned to the ground (shortly before Worcestershire won by 311 runs) and announced “I’ve just been to the dentist’s … I wish I’d stayed there now”. It’s being so cheerful as keeps us going, you know. I think I have mentioned before the man whom I, apparently disrespectfully, but in fact, as anyone familiar with the works of the children’s writer and naturalist “BB” will recognise, most respectfully, refer to as “The Last Gnome”. He is a small man, I’d estimate in his early seventies, whom I often see at Grace Road, and not only there but at Fairfield Road (home of Market Harborough CC) and further afield at Wantage Road, Loughborough, Kibworth, Leicester Ivanhoe, Trent Bridge and anywhere else where cricket is played (I think I once even glimpsed him at the Oval). He is one of that small but happy band who, in full possession of their faculties and a bus pass, spends as close to every day of the season watching cricket as makes no difference. He knows everything there is worth knowing, from where to get off the bus for Ivanhoe’s ground to the fact that the lower reaches of the Northamptonshire Leagues continue playing on well into September. A thesaurus of useful memories (old enough to remember, for instance, the days when Grace Road would fill up after tea when the nearby factories finished for the day), he is full of surprises (once pulling from his over-stuffed rucksack an early edition of “Lillywhite’s Scores and Biographies” that, he said casually, he had just picked up at auction in Sotheby’s). Anyway, the point of this story is that, late last season, I turned up at Kibworth’s ground to watch them play Harborough. Now this, by local standards, is an Important Match (I think Aadil Ali, who is now attracting a little attention with Leicestershire, made some attractive runs) and I was surprised not to see the Gnome there. Kibworth are lucky enough to have two pitches and, during a break in play, I strolled over to have a look at what turned out to be their 3s (or possibly 4s) playing some Northamptonshire village team. And there, sitting in front of the small secondary pavilion, was a full complement of Last Gnomes (he is only the most prominent of their kind). We exchanged pleasantries on the subject of the exodus of players from Grace Road (“I’m surprised anyone wants ’em” and “they’ll just get some more in”) being his sanguine views and I enquired why he was watching this match of no importance instead of the more skillful and significant one on which he had his back turned. “Oh, I’ve found nice little sun trap here, you know. At my age that’s what matters.”. I thought of this when I looked back at the photographs I’ve taken of the matches I’ve seen this Summer. 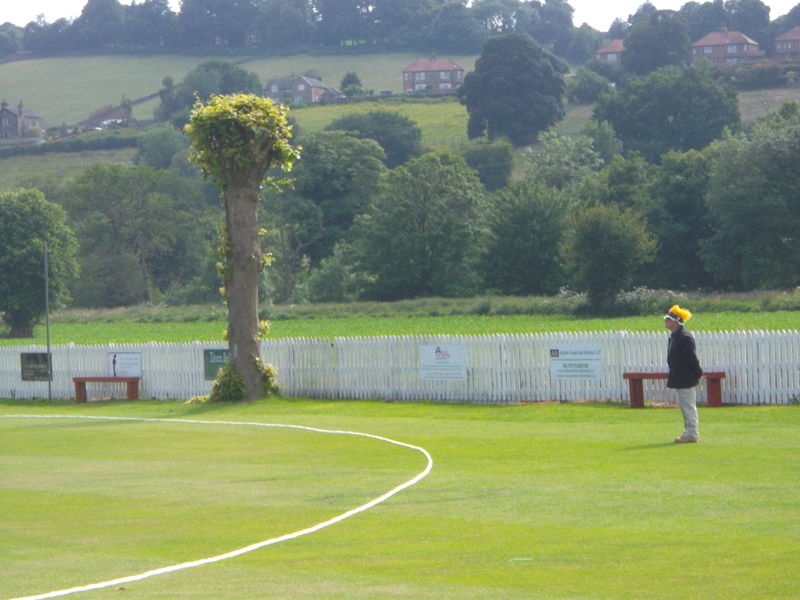 Through circumstances (both personal and to do with this year’s County schedule) I’ve seen very few matches of any real importance since May, but I have found an awful lot of sun traps at Geddington, Rothwell, Harpenden, Finedon, Luton, Belper Meadows, Lady Bay and wherever minor cricket is played. I’ve yet to feel myself shrinking, but if you ever need to know where to get off the bus for the Ivanhoe, I’m your gnome … I mean man.